Chairman Doug Phelps called the regular monthly meeting of the Harford Township Supervisors to order on this snowy, icy evening at 7:14 PM. Supervisor Conrad Owens were present. Supervisor/Secretary Sue Furney was absent. Following the Pledge of Allegiance the minutes of November 11th reviewed. Phelps made a motion to accept the minutes as printed and Owens made a second. Motion carried by two yes votes. The bill list was approved as presented on a motion by Phelps, second by Owens and so carried by two yes votes. Treasurer's report was reviewed and filed by audit. The crew has been out spreading material. This storm has brought a lot of ice and predicted to turn to snow later. The crew will be back in at midnight. We applied to the Constitution Pipeline for a grant to help build a shed for storing winter materials. Good News, we received $10,000.00. We will be meeting with a building contractor for information and cost. It will be good to have the materials covered. Due to a dangerous condition where water running across Stephens Road just down from the intersection of Miller and Tyler Lake Roads. The pipe was plugged and water was running across the road causing a severe ice condition in the winter. The situation needed to be handled on an emergency basis. Resolution 12-14 to authorize the letting of contracts for emergency road and drainage work to be done. Motion made by Phelps to approve the resolution, Owens seconded. So carried by two yes votes. It is time to renew our Work Authorization and General Terms & Conditions for the year of 2015. Phelps made a motion for the renewal, Owens seconded and the motion carried by two yes votes. Assessment permit for Zeigler for a garage was reviewed. The Board has no objection. Chairman Doug Phelps called the regular monthly meeting of the Harford Township Supervisors to order at 7:00 PM in the township office. Supervisors Owens and Furney were present along with visitors Ted Brewster, Jim Phelps, Robert Supancik, and Jean Kelly. After the Pledge of Allegiance the minutes of the October 14th meeting were reviewed. Phelps made the motion to accept as printed and Owens made the second. Motion carried by three yes votes. Tonight's bill list was accepted by motion from Phelps and second by Owens. Motion carried by three yes votes. The treasurer's report was filed for audit. The Budget Workshops were held as scheduled on October 23rd and 28th. Jim Phelps gave the update of activity and plans. The crew is wrapping up routine yearly road maintenance and now getting ready for the winter weather. He asked the Board to consider ordering 40 to 60 tons of DSA to be used for pot hole filling. Owens made a motion to order two dump truck loads of DSA for patching. Doug Phelps made a second and the motion carried by three yes votes. Chairman Phelps announced that the bridge on Lower Podunk has now been inspected by the engineers and the weight limit has been raised to fifteen (15) tons. New signs have been installed. He also announced that the lawsuit against the Township involving the bull at the Harford Fair has been dismiss with prejudice. This means that if during the remainder of the case implicates the township as having been involved with the Fair or the rodeo, the township can be brought back in the case. The 2015 Budget for Township, State, Sewer and Impact Fees have been prepared and are now ready for advertising. The notice will be sent to the Independent and a copy will be at the township office for public review. Shop furnace - While doing the yearly cleaning and maintenance of the furnace, we were informed that the firewall has burned through and is unsafe. We received a quote from Lindsey Oil Company of $3400.00. After a discussion, Phelps made a motion to replace the oil furnace and have Lindsey Oil install a new one. We will check to see if their quote includes the extra duct work that will help heat the back shop room. Motion seconded by Furney and carried by three yes votes. Robert Supancik reported that the ball field has been dug out with the work done by Andres. They are now waiting for the field materials to be delivered. There will be a quick Executive Session following this meeting for the purpose of winter personnel. The regular meeting of the Harford Township Supervisors was called to order in the township office at 7:00 PM by Chairman Doug Phelps. Supervisors Owens and Furney were present as well as Assistant Secretary Carolyn Jennings. Visitors were Dorothy Hagenbuch, Ted Brewster, Robert Supancik, Jean Kelly, Dava & Joseph Cowan, and Maureen Warren. Following the Pledge of Allegiance, the September 9th minutes were reviewed. Phelps made the motion to accept as printed, Owens made a second and motion carried by three yes votes. The bill list was accepted on a motion by Phelps, second by Owens and carried by three yes votes. The treasurer's report was reviewed and filed for audit. Chairman Phelps announced that an Executive Session was held on September 24, 2014 for the purpose of a pending legal matter involving the Tyler Lake Road project. The Board has placed former employee Brad Marcho on the part-time as needed employee list for the operation of equipment. The Roadmaster reports that roadwork continues on Section 3 as weather allows and during inclement weather they will begin preparing the equipment for winter. Phelps made a motion the approved and sign the Post Construction Roadway Restoration Agreement for Lower Podunk Road for Williams. Owens made a second and the motion carried by three yes votes. Also the release for Williams of the completion of Stephens, Grinnell, and Miller Roads was approved and signed on a motion by Phelps, second by Owens and carried by three yes votes. All work is completed to our satisfaction. Driveway and Road Crossing permits was approved for the Moxley Pipe Line for Williams Field Services. We have received word from PennDot bridge department that Lower Podunk Bridge has had the weight limit raised to 15 Tons. This after the grout work that was completed earlier this year and is good news for the bus route in that area. The 2015 Agreement from the Harford Volunteer Fire Company was reviewed. Furney made a motion to approve the Agreement with the terms as last year - Township will collect one (1) mill tax in exchange for Fire Protection in Harford Township. Owens made a second and motion carried by three yes votes. As noted on the bill list, the Fire Relief Association has been paid as well as the Fire Taxes collected so far this year were turned over to the Fire Company. Assessment Permits were reviewed for Francis Wellman, Upper Podunk Road, for a garage and for Bernard Delanali, Upper Podunk Road, for a pole barn. There were no objections for either. We have a quote from Hazleton Oil & Environmental, Inc. to clean up the calcium tanks used for storage. Over the years sludge has accumulated in the bottom of the tanks. Hazelton is the only firm that we have found that will do this service. Arrangements will be made for the cleaning. We have looked into the possibility of paving the lower end of Stephens Road where it meets Route 547. A proposal has been received from ProSeal Paving in the amount of $13,500.00. It would be too late for this year and we will consider this again in the Spring. Jim Ketterer asked the Supervisors to visit the site on Beaver Meadow Road that he plans to restore an old mill site known as Richardson Mills. He has contacted the County Conservation District and DEP and asked the Supervisors to listen to the message concerning DEP's position. All work will fall under the department's approval. The township's pipe under Beaver Meadow Road will not be disturbed and the Board gave their blessing for the project. Chairman Phelps announced that Budget Workshops will be held October 23rd and if necessary October 28th here in the township office at 7:00 PM. Robert Supancik, representing the Harford/Lenox Baseball Association, attending tonight to update the Board of the progress at the ball field. He asked for consideration in our 2015 Budget to help with the planned construction of the second ball field. And the express their appreciation for everything we do for the Association. The regular monthly meeting of the Harford Township Supervisors was called to order by Chairman Doug Phelps at 7:00 PM in the township office. Supervisors Furney and Owens were present. Visitors were Joseph & Dava Cowan, Jean Kelly, Maureen Warren, Ted Brewster, Robert Supancik, Dorothy Hagenbuch, Nathan Edwards, Gerry Yushinsky, Jake Rosen, and Tim Randall. The minutes for the regular meeting of August 12th was accepted as printed on a motion by Phelps and a second by Owens. Motion carried by three yes votes. The minutes of the special meeting of August 15th for the purpose of bidding for more road material that had been overlooked at the regular meeting was accepted on a motion by Phelps and second by Owens. Motion carried by three yes votes. The bill list was reviewed and approved as presented on a motion by Phelps with a second by Furney and carried by three yes votes. The treasurer's report was reviewed and filed for audit. Western Land Services submitted paper work for the Decker Pad for our signatures. Signed were the Ratification of Oil & Gas Lease and an Affidavit of Possession. Mrs. Hagenbuch signed the Third Party Affidavit of Possession, Use, and Occupancy. A driveway permit application was approved for the John Ryman well pad. Roadmaster Phelps has made the inspection. There is an existing driveway on Beaver Meadow Road that will be used. The crew is finishing up the priority roads in Section 1 and then will move back to Section 3. We have received four phone quotes for the Jeffers Road improvements. Approximately 1000 feet on the hill by Jeffer's barn, two pipe replacements a base of quarry rubble. The topping will be added at a later date. Estabrook Excavating has declined to quote; Dale Payne - $6,000.00; Barhite Excavating - $13,700.00; and John Tompkins - $17,300.00. A motion by Phelps to accept Dale Payne's quote for the work was seconded by Owens and carried by three yes votes. The Roadmaster has asked for consideration of additional support for grading and shaping of approximately three miles of road for Nine Partners, Jeffers, and Deer Trails Roads due to current considerations. We will clarify whether we supply the materials for the contractor. The cost will be approximately $9,000.00 for these roads. Owens made a motion to proceed and Furney seconded. More pipe for different projects will be purchased locally from Marie Turner. FOB $4.49 delivered to our yard and job site $8.94. FOB $5.00 delivered to our yard $15.00 for both 2A and 2RC. As we needed more road materials we were utilizing the miscellaneous stone from the budget and buying from Lopke and hiring Gary Blewett to haul and have experienced a savings. After a discussion, Phelps made a motion to accept the lowest bid of Lopke for FOB prices and hire Blewett to haul. Owens made the second and motion carried by three yes votes. One bid has been received for the pipe replacement on Tyler Lake Road to be installed before the Dirt & Gravel Grant can be done. Barhite Excavating submitted a bid of $42, 2220.00. Engineer Glenn Eby was present and reviewed the bid and proposed work and was happy with everything. The bid may sound expensive but there are several issues involved - Tyler Lake, erosion control, drainage, sewer line, etc. After reviewing, Phelps made a motion to accept the bid from Barhite Excavating for replacing the pipe at Tyler Lake. Owens made a second and motion carried by three yes votes. Williams Field Services has submitted an Addendum to the Road Maintenance. In connection with Williams' Miller Compressor Station project, Williams is to conduct a betterment project at their cost and expense on Stephens, Grinnell, and Miller Roads to the Compressor Station driveway. The project involves the replacement of drainage pipes by Williams. Phelps made a motion to adopt Resolution #6-14, second made by Furney and so carried by three yes votes. It was noted that another betterment project will be submitted for Lower Podunk Road but has not arrived as yet. The pipe line work continues in that area. Resolution #7-14 to rescind resolutions #7-06 and #2-13 that appointed COG to accept Recreational Cabin Affidavits and as our Floodplain Administers was adopted by motion from Phelps, seconded by Furney and passed by three yes votes. COG has sent two Escrow Accounts information for our signature to forward them to us. JHA Companies have submitted their Work Authorization for our review and signatures. Phelps motioned to accept the Authorization to perform the duties Sewage Enforcement Officer, Building Code Official (Third Party) and Engineer of Record for one year. Duties of the Engineering will not include the Sewer Plant and operations. Owens made a second and motion carried by three yes votes. Resolution 8-14 to accept JHA's Building Permit Fee Schedule was accepted by motion from Phelps, seconded by Owens and carried by three yes votes. Resolution 9-14 to accept JHA's Sewage Enforcement Fee Schedule was made by Phelps, seconded by Owens and carried by three yes votes. Resolution 10-14 to appointment JHA Companies to accept Recreational Cabin Affidavits for Harford Township was adopted on a motion by Phelps , seconded by Owens and so carried by three yes votes. Resolution 11-14 to appoint JHA Companies as our Floodplain Administrator was adopted by motion from Phelps, second by Owens and so carried by three yes votes. Property survey was discussed and on a motion by Owens we are instructing JHA Companies to survey the garage/office property and to include maps and description. Phelps made a second and motion carried by three yes votes. The year's Susquehanna County Township Officials meeting was announced for October 323, 2014. We will continue to pay for a quarter page ad. Jean Kelly along with Joseph & Dava Cowan attending tonight's meeting to further discuss the Tyler Lake Road Dirt & Gravel project. They feel they are being impacted with more water and sediment since the first stage of the project was completed in 2013. They shared pictures to show the problems they are claiming. They submitted a letter asking that the project be stopped until an engineering study can be done from the area between Purdy and Reservoir Lanes. Phelps explained that a meeting is set for this Thursday (Sept. 18th). Attending this meeting will be a representative from ESM, Jim Garner and Robert Fernley from the County Soil Conservation office, Engineer Glenn Eby. Phelps stated that after this meeting we will discuss and consider a study, and asked Mr. Eby to work up an estimate for such a study. No decision will be made tonight. Robert Supancik of the Harford Lenox Baseball Association thanked us the fixing the driveway to the ball field. Also to inform us that the score board has been installed and that we should add it to our insurance. The Association has received a $15,000.00 grant from the Constitution Pipeline and they plan to use the money to make a second baseball field. Finding the property line pins was discussed with Owens to help with his metal detector. Supancik again thanked us the all we do for the Association and asked us to ..3 consider extra funding while working on the 2015 budget. A special meeting of the Harford Township Supervisors was called to order by Chairman Doug Phelps in the township office at 7:02 PM. Supervisors Owens and Furney were present. The sole purpose of the special meeting is to consider bidding for more road materials that had been overlooked at the regular meeting. The notice of this meeting was printed in the Scranton Times on August 14, 2014. After a discussion Owens made a motion to advertise for bids for 1500 tons more or less of 2A and or 2RC stone material. Phelps made a second and the motion carried by three yes votes. Chairman Doug Phelps called to regular monthly meeting of the Harford Township Supervisors to order at 7:00PM in the township office. Supervisors Owens and Furney were present and visitors Maureen Warren, Gerry Yushinsky, Garry Foltz, Ted Brewster, Fred Grasso, and Tim Randall. The minutes to meetings on July 8 and 15th were approved as printed on a motion by Owens, seconded by Phelps and carried by three yes votes. The bill list was reviewed on accepted on motion by Phelps, seconded by Owens and so carried by three yes votes. The treasurer's report were reviewed and filed for audit. Section One has been started but the crew moved to Sherwood Hill to get it ready for fair week. They will return to Section One then Section Two to continue routine work on secondary road. As time permits they are planning other projects - pipe replacement on Russell, Tingley St., Lower Podunk plus fill, Bartholomew Rd. Also fill is needed on Orphan School along with ditch work, and Wolf Lake Hill. We are gathering estimates for these projects. Mowing is continuing in Section Three. The insurance company has settled our claim for damage done on School Street. Property damage release form has been signed and Doug has contacted Brian Hinkley of Pennsy Asphalt for the micro paving. Work will begin as soon as Hinkley can schedule the work. He will try to give us two days notice so the residents and businesses can be notified as the street will be closed for a couple of hours. All bids were reviewed. Phelps made a motion to accept the low bid from Wince Construction provided it meets the description of the job. If the bid does not include all the work we will go to the second lowest bid. After further reviewing the bids and following a discussion, Phelps rescinded his motion on the grounds that Wince's bid forms were not complete as per our instructions. Only two pages of our forms returned and no detail as to the work they planned. Phelps then made a motion to accept the seconded lowest bid from Barhite. Owens made a second and motion carried by three yes votes. We have requested and received quotes for tree trimming from three companies. Quotes include separate projects and hourly rates. Projects were to include trimming 30ft ROW x 20 ft. high and were received from Browns Tree Service (51,000.00) Brown Hill Tree Co., Inc. (34,800.00) and Four Seasons Tree Service & Landscaping LLC ($36,400.00) and varied for the different areas in question. After a discussion, it was decided to go with the hourly rates. Owens made a motion to allocate $10,000.00 to Four Seasons for hourly work at their quote of $125.99 per hour. Phelps seconded and motion carried by three yes votes. Brown Hill Tree Co. quoted hourly rate of $250.00 and Brown Tree Service would not quote an hourly rate. The Ordinances for leaving COG have been advertising. New ordinance #49 will replace #27 for sewage enforcement; #50 will replace #28 for retaining tank enforcement; and #51 will replace #29 for codes enforcement. Phelps motioned to accept Ordinances 49, 50 and 51 stating JHA Company will be our new codes and sewage authority. Owens made a second and motion carried by three yes votes. The Supervisors made a Declaration of Disaster Emergency on July 9, 2014, due to damaging winds, power outage, and a category One tornado near Kingsley. County EMC assisted our Fire Company in supplying food and water and the Township provided ice for the families affected. An Assessment was reviewed for Keith Baker, Jr. for a shed replacement and the Board had no objections. The regular monthly meeting of Harford Township Supervisors was called to order by Chairman Doug Phelps at 7:00 PM in the township office. Supervisors Owens and Furney were also present. Visitors included Ted Brewster, Gerry Yushinsky, Joe & Matt Cowan, Donna Schulze and Joanne Smith. The minutes of June 10th were accept as printed on motion by Phelps, second by Owens and carried by three yes votes. Bill list was reviewed and approved on motion by Phelps, second by Owens and carried by three yes votes. Treasurer's report was filed for audit. The crew is finishing up section 3 and plan to start section 2 by the end of the week pending on the weather. They are working the main roads now and will be back to each section to complete the remaining roads later in the season. Mowing is now in section 2. The Charles Road project is planned to begin soon. Joe Cowan attending to speak about the Dirt & Gravel road work that was done on Tyler Lake Road last year. He showed evidence that sediment is flowing into the lake and feels that the problem stems from eliminating a cross pipe that had originally been planned. After a discussion it was planned to have Conservation office contacted and arrange for a meeting on site to review the situation. The Dirt & Gravel Grant submitted for this year has been approved for Tyler Lake Road. This work will be an extension of the 2013 Grant road work on this road. A motion was made by Furney to sign the Agreement, Owens made a second and motion carried by three yes votes. Attorney Hailstone has forwarded three ordinance for the Township to terminate membership with the Council of Government. The proposed ordinances will be #49, #50, and #51 and with a motion by Furney and a second by Owens the proposed ordinances will be advertised. Final consideration will be at the August meeting. In order to apply for a road occupancy permit for road work on the intersection of Rt. 11 and Plank Road, a Resolution is needed stating that Plank is a Township owned road. Therefore, Resolution #5-14 was approved by motion from Furney, seconded by Owens and carried by three yes votes. Tioga Environmental Consulting, LLC has applied for Noise Waiver for the Strauss Well Site. Waiver is for a one year period and the Board had no objections. A recent blockage in the main sewer line along Tingley Lake Road was reported. Phelps and Owens worked long hours with Joe Sheposh, Rocky Estabrook and Hallstead Sanitary and Roto Rotor to break the blockage and repair grinder pumps effected by blockage. Because hydromatic pumps were needed to replace burned out ones, Phelps made a motion to ask Benton-Nicholson Sewer Authority if we could purchase four more pumps from them. A second was made by Furney and motion carried by three yes votes. The monthly meeting continued at 7:00 PM as Chairman Phelps called it to order. Due to the power failure, last week's meeting was not recorded and Ted Brewster has sent us his recording. The storm turned out to be an F1 tornado with Kingsley and surrounding area receiving considerable damage. Tonight's visitors included Garry Foltz, Ted Brewster, Ken Gallinger, Gerry Yushinsky, Joe & Matt Cowan, Steven & Rhonda Smith. The Roadmaster has asked for quotes for improving Goff Road. The Board is considering having work on for building up the road 2 feet, 18 feet wide for a length of 1,584 feet. Owens made a motion to advertise for bids for this road work, a second was made by Furney and was so carried by three yes votes. Thank you letters were read from Pricilla Allen and Ted Brewster for the long hot and smelly hours that were recently spent on the sewer blockage and pumps. Ken Gallinger also attended tonight to thank you the Supervisors for their dedicated work in this emergency sewer work. Supervisor Owens addressed Garry Foltz regarding his request last month after the meeting for something to be done about his cancelled vision insurance. Owens stated he has done some research and discovered that according to section 606 of the Second Class Code Book, (in part) "Any change in salary, compensation or emoluments of the elected office becomes effective at the beginning of the next term of the supervisors. A decision by the township to pay, in whole or in part, to include supervisors not employed by the township in insurance plans, as authorized in subsection ©, shall not be implemented with regard to any nonemployee supervisor until the beginning of the next term of that supervisor". Owens further read Municipalities Planning Code, 53 P>S> 65606 from our attorney stating the same description but adding "In other works, no Supervisor may receive insurance benefits during the first term in office. Owens found that Foltz applied for the insurance plan on January 22, 2008, the first month of the first year he was elected. So what it states is that Foltz was not entitled to that insurance under Pennsylvania law so we are not going to pay you back that money. Foltz answered that he was employed by the township but Owens pointed out that he was not employed until 2009. Foltz continued saying that he "took over" when the secretary had knee surgery and the Roadmaster was out for about four months full time. So he was entitled and was paid for his portion of the insurance as required. He accused Sue Furney as the administrator of the insurance plans of cancelling his vision insurance without discussion by the Board on November 1, 2011, as an intentional act. Owens stated that they is not the act he is talking about stating that he was referring to 2008 when Foltz was not employed as an employee in this Township. He has been to the lawyer and already discussed it with them. Owens told Foltz that if he wants to pursue this issue - go for it. He further said that he is not the kind of guy to back down from anything. "I've sat here quietly for six months and everything you've said' I've researched. You have made all kinds of comments in here and I have researched everything you have said, Mr. Foltz, everything. So this is one of them and when you brought this up, I decided to look into it and what I found is you're not entitled to it'. Foltz replied that it's Owen's opinion. Owen's then said "well, my opinion and the law's opinion and basically what happened here, Mr. Foltz, is the tax payers kicked in over $56,000.00 on their part for something (the entire insurance package) that you were not entitled to". Foltz still insisted that the code book says that Supervisors are entitled to the same benefits as the employees of the township except pension. And Owens stated that if you (the Supervisor) were a working Supervisor. Visitor Gerry Yushinsky put the question to Foltz - then basically when you took the job it was to get insurance. Because the only time he called Foltz, he never got anything done from him. He said he had been over here a couple of times and Roadmaster Eric Allen told him he would have to check with Foltz. Statements which Foltz denied stating to check the records that he was out working with the crew. Foltz then accused Secretary, Sue Furney, of receiving illegal pension and payroll she was giving herself. And that when he brought it to the attention of the auditors 'she started playing her games and accusing me of different things'. Chairman Phelps announced that an Executive Session will be held after tonight's meeting for the purpose of personnel. Chairman Doug Phelps called the regular monthly meeting of the Harford Township Supervisors to order at 7:00PM in the township office. Supervisors Owens and Furney were also present. Visitors included Carolyn Jennings, Maureen Warren, Garry Foltz, Fred Grasso, Ted Brewster and Pat Farnelli. The minutes of the May 13th meeting were accepted as printed on motion by Phelps, seconded by Owens and carried by three yes votes. Bill list was reviewed and approved for payment on motion by Owens, seconded by Phelps and carried by three yes votes. Treasurer's report was filed for audit. Wayne Frederici was hired as part-time help for the cleanup program. Phelps made the motion to hire him as a part-time employee in cases of emergency. Owens made a second and motion carried by two votes with Furney abstaining. Phelps read an announcement from the Harford Volunteer Fire Company that they will be holding an Open House on June 14th to celebrate the tenth anniversary of the new fire house. Representatives from JHA Companies were invited back to this month's meeting to further discuss hiring them for sewage enforcement and building inspections. After a period of questions from the Board to Glenn Eby and John Watts, Phelps made a motion to disband from COG at the end of the month and go with JHA Companies for all the services available. Owens made a second and motion carried by three yes votes. We will need to pass an ordinance to withdraw from COG before we can refer residents to JHA. The crew is currently working in Section 3 doing the grading, drainage, and yearly maintenance work. Road side mowing is currently being done in Section 1. Phelps made the motion to award the bid to Eastern Industries as the lowest bidder. Furney made a second and motion carried by three yes votes. Phelps made a motion to award the bid for DSA materials to Eastern Industries as low bidder. Conrad seconded and motion carried by three yes votes. The regular monthly meeting of the Harford Township Supervisors was called to order followed by the Pledge of Allegiance by Chairman Doug Phelps with Supervisors Owens and Furney present. Visitors were Ted Brewster, Dorothy Hagenbuch, Jim Phelps, John Watts, Glenn Eby, and Garry Foltz. The minutes of April 08 were reviewed and accepted as printed on a motion by Owens, seconded by Phelps and carried by three yes votes. The bill list was approved by a motion from Owens, second by Phelps and carried by three yes votes. Treasurer's report was reviewed and filed for audit. JHA Companies representatives John Watts and Glenn Eby gave a brief outline of what their company can do for us. They would be able to handle the work currently contracted to COG (Sewage enforcement, building permits and inspection). Their services could also include engineering and surveying. After their presentation, the Board asked that they return at next month's meeting after we have had a chance to contact other Townships which use their services. Roadmaster Jim Phelps reported that the crew is in Spring & Summer mode, addressing complaints and getting ready for the summer work. Doug Phelps reports that the temporary fix by Nu Pump on the Lower Podunk Bridge has been completed. PennDot will do an inspection next month and hopefully the weight limit on the bridge can be increased. There is a need to go out for bids for additional stone materials. We will advertise for 500 tons of 2B stone and 10,000 tons of DSA (Driving Surface Aggregate). Bids will be opened at our regular June meeting. We have received a quote from Barhite to do work on Charles Road. Proposed work is a 36' x 16' for black topping where Charles Road meets Route 11. And to add 250 tons of DSA on the road surface. Owens made a motion to proceed with this proposed work on Charles Road by Barhite at $8740.00. Motion seconded by Phelps and carried by three yes votes. Second stage of work on Tripp Road will be done tomorrow. The Debt Act Ordinance for leasing the CAT loader has been rejected by DCED due to the wording of the final legal description. Cleveland Brothers has been very patient with us trying to file this Ordinance but they need to have the financing settled. Phelps made a motion to pay for the loader using funds in the Township CD Savings Account and use this year's Impact Fees to put the funds back in the CD Savings. Owens made a second and the motion carried by three yes votes. Assessment permits were reviewed and approved for Dan Bonham (garage) and Josephine Gear (canopy). The advertising has been done for the equipment for sale by the Township and four bids were received. Three for the Ford Tractor - Robert Oakley bid $350.00; Wayne Frederici bid $1254.47; and Cosmello's Auto Sales bid $999.00. Phelps made a motion to accept the highest bid of $1254.47 from Wayne Frederici, seconded by Owens. Motion carried by two yes votes with Furney abstaining. The 350 Utility truck had one bid that from Cosmello's Auto Sales for $501.00. After discussion and consideration, Owens made the motion to accept the bid. Second made by Phelps and motion carried by three yes votes. Having the property lines surveyed was discussed but tabled for further information. A discussion of the need for sewer pumps was tabled last month and we have contacted David Klepadlo for more input. Also, Benton Nicholson Sewer Authority has offered to sell us five new hydromatic pumps. This style pumps are used in a couple difficult places in our system and are no longer being made. Klepadlo recommended that we have the five in stock and also as we have no new E1s for replacement asks that we consider buying six of these. After a discussion, Phelps made a motion to buy five hydromatics and six E1 pumps. Owens seconded and motion carried by three yes votes. Chairman Doug Phelps called the regular meeting of the Harford Township Supervisors to order at 7:00 PM in the township office. Supervisors Owens and Furney were present. Visitors were Jim Phelps, Garry Foltz, Carolyn Jennings, Maureen Warren, Benny Diaz, Lisa Schmidt, and Terry VanGorden. The minutes of March were approved as printed on a motion by Phelps, second by Owens and carried by three yes votes. Bill list were accepted by a motion from Phelps, second by Owens and carried by three yes votes. Treasurer‘s report was reviewed and filed for audit. Road Master, Jim Phelps, gave his report - waiting for frost to leave, filling pot holes, doing a pipe survey, sign repairs and ditch cleaning. The 2014 Ford 350 has arrived. The need for lighting - flashers and roof light bar - that were overlooked when ordered were discussed. Also door lettering needs to be done. Phelps made a motion to send the 350 to Powell‘s Sales for wiring the lights and fuel tank pump. Owens seconded and motion carried by three yes votes. We will check on the cost of lettering from Molenko‘s and Zeulewski. The condition of the Kodiak was discussed. It is felt the best way to go is have a new dump box installed. Owens made a motion to get the work done at Powell‘s Sales with replacing the dump box and have it rewired. Dump box quote of $5819.00 plus the cost of wiring. Phelps made a second and motion carried by three yes votes. The 2003 Ford 550 matter tabled from last month was again discussed. After asking around for public opinion, Owens made a motion to sell the engine to Jackson Township. After the issue was debated and further discussed, Furney made a second and the motion carried by three yes votes. Unused equipment was discussed to be put up for bid. Phelps made a motion to advertise for sale the 350 Utility Shop Truck and the sickle bar mower and tractor. A second was made by Owens and motion carried by three yes votes. The Lower Podunk Bridge that has long been on PennDot's critical list was discussed. Yearly inspections show that it has a serious scouring problem. Owens have researched and a gotten a quote for a temporary stabilizing process by the placing grout bags. After a discussion, Phelps made a motion to contract with NuPump Corporation do the "temporary fix" on the Lower Podunk Bridge. Owens seconded the motion and it carried by three yes votes. The Contract was signed and arrangements will be made. We will contact DEP for the necessary permit. Road Master Phelps has been looking at the road conditions. He feels Tripp Road is a project to look into. He has received quotes for the work on this road. With the assistance of a gas/pipeline company supplying some of the materials and using stone material from the compressor station site, we would like to build up the base of the road and top with modified. He has received two quotes and two local contractors have declined. Barhite quoted $17,400.00 for the work and Estabrook quoted $18,100.00. Owens made the motion to Barhite as lower bidder to the specified work on Tripp Road. Furney made a second and motion carried by three yes votes. Cabot Oil & Gas units one and two of the Adams pad are now on line and we have received the Division Orders for both units. Division Orders were signed and will be returned. Cleanup dates were set for the first week of June. Hopefully we can be done in three days. Cost this year was established at $60.00 per load with tires at $6.00 each - passenger and light truck tires only on a motion by Owens, seconded by Phelps and carried by three yes votes. We will look into dumpster prices. Steve Smith has expressed an interest to act as a Deputy Emergency Management Coordinator. Phelps made a motion to accept Steven Smith for this position, Owens seconded and motion carried by three yes votes. Montrose Borough has asked for the assistance of Harford Fire Police for two parades in their Borough. Furney made a motion to permit our Fire Police to participate in traffic and crowd control at Montrose May 26th and July 4th parades. Phelps seconded and motion carried by three yes votes. Assessments permits for Gerald Albeck and Michael Bills were reviewed. Albeck was approved and after checking with COG concerning floodplain, Bills will be decided. SEWER: All the E-1 Pumps have been used. There are some refurbished ones at the plant. We will obtain information for prices and discuss further next month. An Executive Session will be held immediately after tonight's regular meeting for an ongoing legal matter. The regular meeting of the Harford Township Supervisors was called to order in the township office by Chairman Doug Phelps at 7:00 PM. Supervisors Owens and Furney were present. Visitors were Ted Brewster, Maureen Warren, Garry Foltz, Connie Breese, Benny Diaz, Dorothy Hagenbuch, Pat Farnelli, Bob DeLuca, Jim Phelps, and Carolyn Jennings. The minutes of February 11th were reviewed and accepted by motion from Owens and second by Phelps. Motion carried by three yes votes. The bill list was approved as printed on a motion by Phelps, second by Owens. Motion carried by three yes votes. The treasurer‘s report was filed for audit. Road master Jim Phelps reported that we are riding along with Mother Nature. The crew is working on icy conditions and filling pot holes when able. He has gotten prices for grader tires for both radials and bias. Four tires are needed before spring work begins. After a discussion of benefits and pricing for radials at $1,160.00 each, Owens made a motion to purchase all six radial tires for the grader from Sandone Tire. Seconded by Furney and carried by three yes votes. The 2003 Ford 550 is no longer on the road and will not pass inspection. The question was asked, “Are we going to keep dumping money into it or buy a new one”. Because of its condition, a new one has been researched. After a discussion, a motion was made by Phelps to purchase a new 550 Ford through the Costars Program with our specifications from Hondru Ford for the chassis at $35,471.81 and the dump box and setup from Powell‘s Sales at $22,391.16. Payment will be made from our Special Savings CD (gas lease funds) Account. Owens made a second and the motion carried by three yes votes. A neighboring township has expressed interest in purchasing the engine and clutch from the 550. We will be saving and reusing the spreader and other parts for our use. After a discussion, the matter was tabled to look into more details. The Ordinance to adopt the Debt Act is ready for passage. Furney made the motion by adopt Ordinance #48 for the Lease Purchase agreement with Caterpillar Financial Services Corp. for the new 924K CAT wheel loader. Leasing amount is $108,345.60 for a period of five years at the interest rate of 3.2%. Phelps seconded and motion carried by three yes votes. Relating documents - Debt Statement, Notes of Debt Statement, Borrowing Base Certificate were signed. The Harford Township Auditors were present to give their report. Report was read by Bob DeLuca and is attached to the recorded minutes. A sub-division for Jean Bennici to Antonino And Suzanne Bennici, and Antonino and Suzanne Bennici to Jean Bennice were reviewed and accepted with no objection. An Assessment Permit for a garage for H. Crispyn, Cottage Lane was reviewed and approved. Since the present computer program of Windows XP will soon expire, quotes have been received for the upgrading from JMF Computer. Jeff Flynn has met with us and can build and set up computers for our needs both the office and the shop. Furney made a motion to proceed with the computer up dates. Owens seconded the motion and it carried by three yes votes. Bids for this year‘s road materials and fuel have been received. Attached are the proposals and the results of the bidding. DNR Lawn Care has again expressed an interest in the cutting and trimming of the township and the sewer plant. Furney made the motion to accepted this proposal of mow and trim the township building area weekly or as needed for $30.00 and the sewer plant area for $40.00 same as last year. Phelps made a second and motion carried by three yes votes. Public comments were heard and the meeting was adjourned. The regular meeting of the Harford Township Supervisors was called to order at 7:00 PM in the township office by Chairman Doug Phelps. Supervisors Owens and Furney were present along with visitors - Ted Brewster, Robert Supancik, Garry Foltz, Michele Pavelski, Maureen Warren, Dana Empet, Dorothy Hagenbuch, and Pat Farrelli. Everyone stood and recited the Pledge of Allegiance. Minutes of the January 6th Reorganization meeting were reviewed and on motion by Owens, second by Phelps were accepted. Motion carried by three yes votes. The minutes of the regular meeting of January 6th were accepted on motion by Furney, second by Owens and carried by three yes votes. Tonight‘s bill list was lengthy due to the inclusion of two months of bills. After a review by the Board, approved the bill list on motion by Phelps, second by Owens and carried by three yes votes. The treasurer‘s report included both January and February‘s accounting, was reviewed and filed for audit. 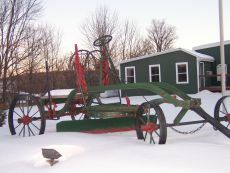 Assistant Roadmaster, Doug Phelps, reported that the crew has been busy plowing and cindering. It has been extremely cold causing the anti-skid material to freeze in the spreaders. The crew is doing the best they can in these conditions. NOTE: This is proving to be an old fashion winter. Night time temperatures are consistently below 0 , sometimes double digits, and day times only reach the teens or below for several days. We have received three bids for the old loader. They were opened by the Board with the following results: Cosmello‘s Auto Sales bid $1500.00; Manny Diaz - $1650.00; and William & Joanne Himko submitted a bid for $3250.00. Phelps made the motion to accept the highest bid of Himko for $3,250.00, Owens seconded and motion carried by three yes votes. Phelps stated that we have received a letter from Hondru Ford informing us the chassis is there and ready to ship to Powell‘s Sales and Service. We will be sending Hondru their payment from Impact Funds. Representing the Harford Lenox Baseball Association tonight were Robert Supancik, Dana Empet, and Michele Pavelski. Supancik stated they were here tonight to ask for the customary yearly donation of $500.00 to help the League. He also presented their plans to install a scoreboard and presented the information for the project. The cost of the scoreboard and the installation is figured to be $6,040.00. Lenox Township has donated $5000.00 toward the project. After a Board discussion Phelps made a motion to donate the yearly $500.00 to the Harford Lenox Baseball Association and in addition $1,040.00 for the completion of the scoreboard and to take care of the permit and fee. Owens seconded the motion and it was carried by three yes votes. Williams Field Services Company has submitted Driveway Permit applications and Road Crossing permit applications for the Blanding Pipeline and the Union Hill Pipeline. Roadmaster, Jim Phelps, has inspected these sites with Williams crew has approved the sites noting his requirements for pipes etc. Doug Phelps motioned that on the recommendation of the Roadmaster to approve these permits for Upper Podunk, Lower Podunk, and Wescott Roads for the Pipelines. Furney seconded and motion carried by three yes votes. As usual the Board will reject the Terrorism Coverage on our insurance package. Motion to reject made by Phelps, seconded by Owens and so carried by three yes votes. The Tax Collector‘s Exoneration Report was reviewed. One property was listed as the County had it assessed twice and fifty names were presented that are no longer in the township. Motion made to accept the list by Owens, seconded by Phelps and carried by three yes votes. The Board considered a resolution for the proper guidelines to remove Township property and records from the premises. After the proposed resolution was read by Owens, a motion was made by Furney, seconded by Owens to adopt Resolution 4-14 - The Sign Out Policy. Motion carried by three yes votes. Harford Fire Police cards have been presented for recognition. Motion was made by Owens to accept this year‘s Fire Police (copy attached), seconded by Phelps and carried by three yes votes. In order to enter the Agreement to Lease the CAT Loader, we must apply to DCED for approval. The necessary Ordinance has been prepared by Att. Hailstone. Furney made the motion to advertise our intent to pass this Debt Act Ordinance. Motion seconded by Owens and so carried by three yes votes. Bid proposals for the road materials will be advertised and will be ready to open at our March meeting. Phelps made a motion to proceed with the process, Owens seconded and motion carried by three yes votes. As an afterthought, referring to the regular meeting of February 6th, Phelps motion to clarify the time frame in keeping meeting tapes as there will be no limit. Owens seconded and motion carried by three yes votes. The regular monthly meeting of the Harford Township Supervisors was called to order at 7:25 PM. after the reorganization meeting by Chairman Doug Phelps. Supervisors Owens and Furney were present along with visitors - Garry Foltz, Dorothy Hagenbuch , Ted Brewster and Jim Phelps. The minutes of December 12, 2013, were accepted on a motion by Owens, second by Phelps and carried by three yes votes. The minutes of December 17, 2013, were accepted on a motion by Furney and seconded by Owens. Motion carried three yes votes. The December 31, 2013, bill list was approved on a motion by Phelps, second by Owens and so carried by three yes votes. The January 6, 2014, bill list was approved on a motion by Phelps, second by Owens and carried by three yes votes. Treasurer‘s reports will be reported in February as the bank statements are not available yet. Foltz asked what will be done with the meeting tape recordings. After a brief discussion Owens suggested a time limit of seven years for keeping the tapes and Phelps commented he has no problem keeping records in case of questions in the future. They will be retained a minimum of seven years. Jim Phelps reported doing the best we can with the weather conditions. They have addressed drainage problems. He also gave an update on the shop truck on order. The chassis should be delivered to Powell's for the utility box around January 20th. Advertising for the gas lease on the 1.38 acres has been completed and one bid was received. Cabot has bid a non-surface lease for $4,830.00 for the parcel ($3500.00 per acre) and 18.75% royal. A motion to accept the proposed lease of Cabot Oil & Gas was made by Owens, seconded by Phelps and carried by three yes votes. Resolution #1-14 was accepted stating the Harford Township Board of Supervisors will sign the lease with Cabot that was accepted at our regular meeting of the Board. Motion made by Phelps, seconded by Furney and carried by three yes votes. Furney made the motion to approve Resolution #2-14 for Peoples Security Bank & Trust changing the required signatures. Phelps seconded and motion carried by three yes votes. New signature forms for all accounts were then signed by all Supervisors. The resolution required for leasing the CAT loader was presented. Phelps made a motion to approved Resolution #3"14 for Harford Township to lease and finance a 2014CAT 924K wheel loader serial number PWR02126 as per term previously approved. Second made by Furney and motion carried by three yes votes. A motion to establish mileage reimbursement for 2014 at the IRS rate of 56 cents was made by Phelps and seconded by Owens. Motion carried by three yes votes. An Executive Session will be held immediately after this meeting for personnel matters. Meeting adjourned 7:50 PM by motion from Phelps, seconded by Owens. So carried three yes votes. Included in Motion: By establishing the meeting schedule for 2014, Resolution 2-02 is now cancelled. Motion carried by three yes votes. Memorial Day May 26; July 4; Labor Day September 1; Thanksgiving Day November 27; Christmas Eve December 24; Christmas Day December 25; New Years Eve December 31 as one/half day; and New Years Day January 1, 2014. ALL MOTIONS CARRIED BY THREE YES VOTES. Foltz turned over Township items that were in his possession: Meeting tapes and keys.